Monica Mary Stapleton-Bretherton was born in 1886 at Fareham in Hampshire. She was the tenth child of Frederick Annesley and Hon. Isabella Stapleton-Bretherton. In 1912 she was a bridesmaid at her sister Ethel’s wedding in London. Monica was at Rainhill when her sister Edith’s baby was born in 1916. 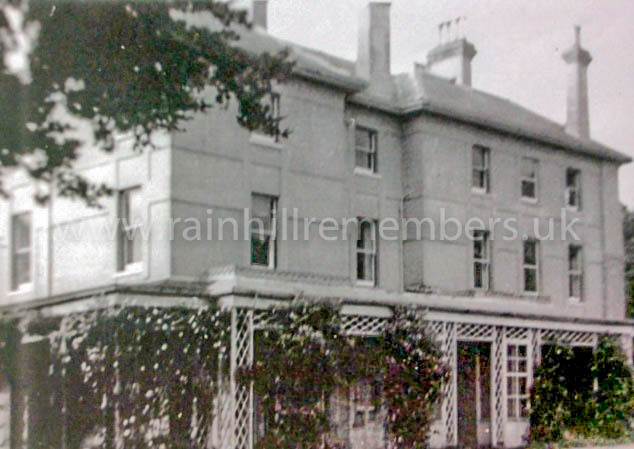 During the years 1914-1918 she lived part of the time at The Hall Rainhill with her parents and she spent some time in London volunteering as a VAD nurse and doing canteen work. James Dorgan was born in 1873 in Ireland and educated at Queen’s College in Cork. He qualified as a doctor in 1898. In 1900 he entered the Royal Army Medical Corps. In 1903 he passed the Irish Diploma of Public Health with honours and was promoted to Captain. In 1908 he attended a course at the Royal Army Medical College in London. In 1912, he was promoted to Major. During the First World War he served as Lt Col. with the RAMC in France and in Egypt. He was in Gallipoli, Greece, Macedonia and Turkey. Between 1916 and 1917, he held the post of Assistant Director of Medical Services of the 16th Army Corps in Salonika. He was promoted to Lt Col in 1917. Towards the end of the war, he was in Cologne with the army of occupation. In Aug 1921 he was at the Military hospital in Belfast. In 1924, at the time of his marriage, he was attached to GHQ of the Rhine Army. He ceased to be on the reserve of officers in Oct 1928 due to his age. 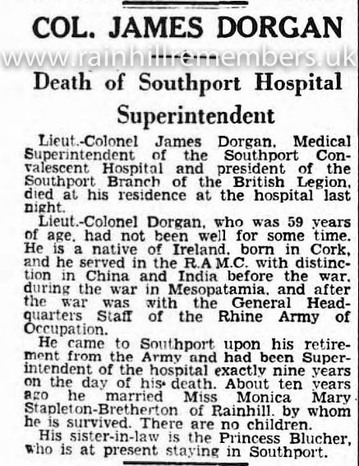 He and Monica went to live in Southport and he became Superintendent of the Flagstaffe Convalescent Hospital. 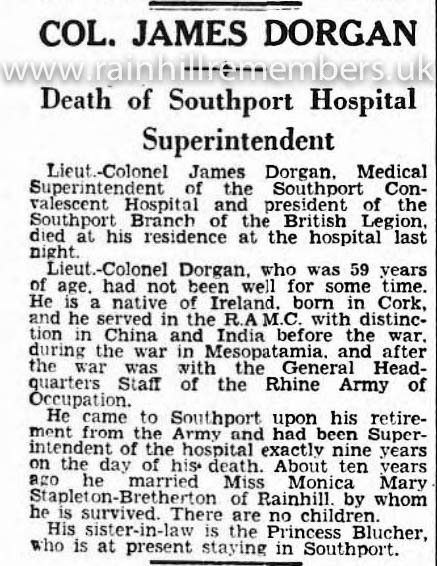 James Dorgan died, aged 62 years, on September 1st. 1935 at the Flagstaffe Convalescent Hospital in Southport. Requiem Mass was held at St. Marie’s Roman Catholic Church in Southport followed by a funeral at St Bartholomew’s Church, Rainhill. Monica died in 1952 aged 66 years.